(Newser) – Cesarean sections, long decried as ubiquitous, costly, and often unnecessary, have halted a dozen years of consecutive increases, finds a new federal report. The rate of C-sections was flat, at 31.3%, from 2009 to 2011, and mothers-to-be are waiting until closer to their due dates to go under the knife. It's good news, experts say, showing increased awareness of C-section risks—such as medical issues for the baby, infection, and very rarely, death—and the importance of full-term delivery at 39 to 40 weeks. The number of C-sections at 38 weeks dropped 5%, while the 39-week rate got a 4% spike, the AP reports. There are several ways to avoid C sections. First and foremost, do NOT go to a teaching hospital. Those residents want practice, and are itching to pick up a scalpel. Wait until your labor pains are less then five minutes apart to get to the hospital. Don't go into the hospital until they are even closer together. Mammals in labor go to dark and familiar places to give birth. A hospital certainly does not fit that bill, and labor slows down as your lizard brain thinks it is in a dangerous place. Walk, swing on a swing, dance---anything to stay upright when in labor, for as long as possible. Another reason not to go to the hospital early, where they will hook you up with monitors etc...and get you flat on your back. The only way you could then be in a worse position for birth would be to hang you by the ankles... If your labor won't start after you due date, take cod liver oil. If that does not start labor, your fetus is not ripe yet; wait two weeks and try again. Have your birth at home when possible. The germs in your house are much less dangerous then the germs in the hospital nursery. 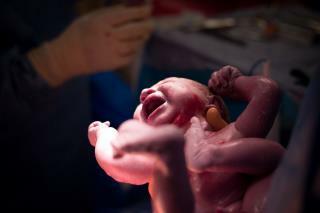 The more you do c-sections the more you will have to do them in the future. Natural selection has been over-ridden to allow fat headed people to be born and their kids will also have fat heads. Doh!